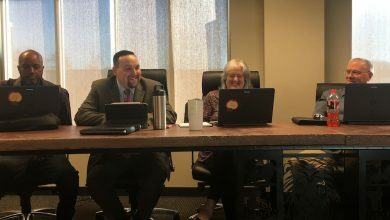 Luther, OK – For your planning purposes, here a few MUST KNOW items to work into your calendar for events around Luther, OK.
OPEN: Our Town Eatery is open! Luther’s newest restaurant turned over the OPEN SIGN and presented a menu that features pizza, burrito bowls and more. Like their Facebook page to get the scoop. PLANT SALE: The FFA holds its annual plant sale Friday, April 12, 9 am – 5pm, and Saturday, April 13, 9 am – 2 pm, at the greenhouse over by the middle school. They have tomato plants, annual bedding plants and more! Support your local FFA! 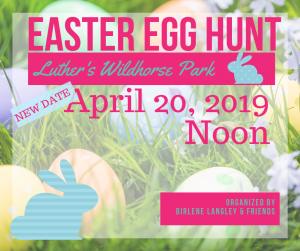 EASTER EGG HUNT: Because apparently the weather might give us one more Saturday of cold and yuck, the annual Easter Egg Hunt has been moved to April 20 (instead of April 13). Birlene Langley and friends have stuffed thousands of eggs with candy, change, HotWheels and other prizes. It’s at Wildhorse Park at High Noon on April 20. Wildhorse Park is near the Dollar General, which is near Rock N Vapes and that’s near BREW 66 coffee. Did you catch that, there’s lots to do on the “east” side of Town on Dogwood? 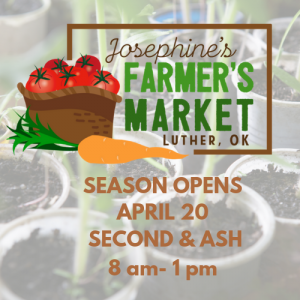 JOSEPHINE’S FARMERS MARKET: Before you hit the Easter Egg hunt on April 20, stop by the inaugural Saturday for the Luther Farmers Market that opens at 8 am and goes until 1 pm, every Saturday. It’s in a new location this year, in the lot at Second and Ash, across from DJ’s BBQ, with easy access to downtown shops like the hardware store, S&H Mercantile, Josephine’s Cafe, Rustic Farm, Urban 66, 116 Farmstead Market & Table and Beth’s Baubles and bits. Vendors will have plants, herbs and other “early” produce. There also will be local vendors with eggs and hand-made items like art, soaps and gifts. BONUS: The Luther Fire Truck will be on hand for kids to “touch a truck.” The Farmer’s Market crew has planned fun activities for many Saturdays. Are you a vendor, join and find info and the application on the Luther Farmers Market FB page. 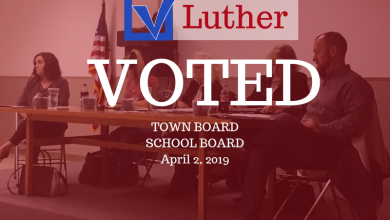 There’s a lot to do in Luther these days; and each one of these items represents a lot of work, passion and even risk to bless our community and earn your patronage. 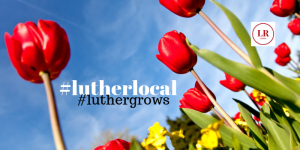 #lutherlocal #luthergrows.